Hannah came to me as a foster dog. Her back story is mostly unknown as she was found in a ditch with a litter of puppies. Her early years were obviously unpleasant, and maybe even cruel. She came to me from her present owner who was in a desperate situation and needed a place for Hannah to stay. And stay with me she did, for the last two years. Hannah was an incredibly sweet dog with the gentlest of souls. She was part Greyhound, part Saluki. 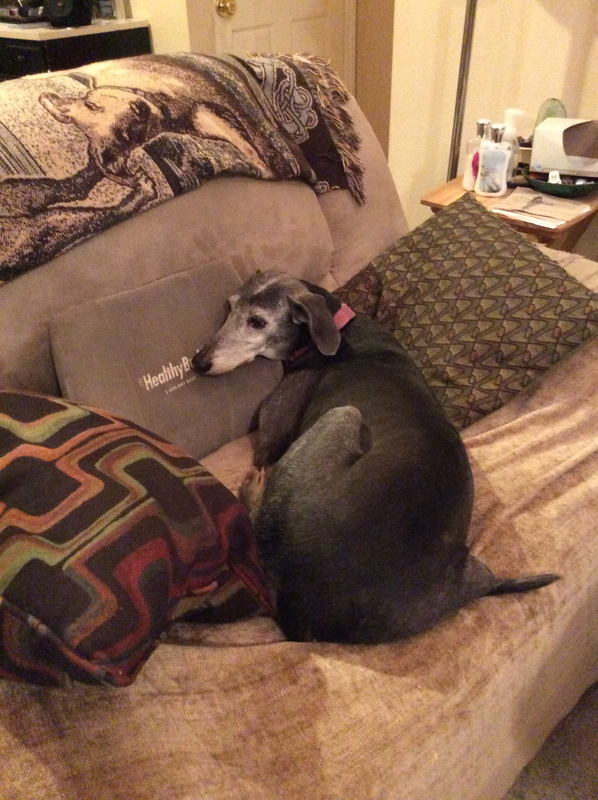 The Saluki heritage gave her a very reserved demeanor and one that was fairly expressionless. What I mean by that is the expression on her face NEVER changed! She held the same expression always –and some folks thought she looked a little melancholy. I thought so at first too, until I got to know Hannah. Her expressions came through her body, not her face. I knew she was excited not by the look on her face but by the thump of her tail against the couch cushion when I came in the room. I knew she was having fun, not by her facial expression but by the way she moved, the way she jumped from bed to bed, leap-frogging and bed-hopping. Her ears would stand straight out and she’d turn and look up at me from her landing position, as she considered pouncing again. I knew she was content when she would lay in the sun, rolling in the grass, from side to side, over and back, and finally come to rest on her back, her legs stretched out and her front paws poised like a praying mantis. Everyone who met Hannah instantly feel in love with her. She was just so sweet, so calm and so mellow. Hannah liked mellow. When the other dogs started to get boisterous or rowdy in the living room, she would just pick up and retreat back to the bedroom and hang out there until things quieted down. When Hannah first came to me she was obviously feeling displaced and probably a bit confused, having left the stable home that she’d known for several years. She didn’t want to eat the first few meals. That’s quite normal when a change occurs in a dog’s environment. But she needed to eat! So I would bring her bowl over and hand-feed her. Goopy gobs of kibble mixed with mushy canned food. It was a messy job but at least she ate everything. And this went on for awhile, day after day of hand-feeding, when I finally realized, she’s playing me! She’s just a diva and wanted to be hand-fed all the time. Silly girl. When she started eating on her own, she liked to eat in private. She didn’t like any distractions or any movements around while she was eating so she took her meals in my bedroom, usually on top of my bed. She was such a princess! But then she stopped eating. Wouldn’t eat anything. At all. I took her to my vet and she was diagnosed as heading into kidney failure. There’s no recovery from kidney failure so she was on borrowed time. I was told it could be a few weeks or a few months. That was two weeks ago. After her 4-day stay in the hospital getting pumped with IV fluids she came back home and was doing fabulous! I was so happy. She was back to her old self. Trotting in the yard, rolling in the grass, bed-jumping. And she would get especially excited at treat time. But she was still being very finicky with the food. I had to get really creative with meal planning just so she would get something into her belly. And she went back to the Diva mode and I would hand-feed her meatballs, chicken nuggets, ham, bread, rigatoni noodles with sauce and whatever else she would eat to keep her strength up. I ended up throwing a lot of stuff out. Surely she’ll eat tuna-fish, right? What dog doesn’t like tuna fish? Hannah doesn’t. She ate oatmeal one day and I thought, Great! Oatmeal is good for her. So I made a big pot of it. She never ate oatmeal after that first time. One day she’d eat something and the next day she decided she didn’t like it. I kinda think she went back to playing me, but I was happy to oblige. She had lost a lot of weight and was continuing to lose weight, but again, she seemed like she had really turned a corner. Until Tuesday. Monday she didn’t eat anything at all. And believe me, I tried EVERYTHING! She would take food in her mouth but spit it right back out. Tuesday, same thing. Wouldn’t eat at all. She was getting weaker. Then she suddenly couldn’t sit still, like she couldn’t get comfortable. She finally settled down, as we all did for the night. On Wednesday morning when I got up she was unresponsive. Breathing, but unresponsive. I rushed her to the vet and the clinic staff whisked her back to a room. The vet came out a short while later and said that her blood pressure was so low they couldn’t even get a reading. They had her on oxygen and did a blood draw, but her blood was sludgy and coagulating. The vet wanted to see what the blood work looked like because she thought it might not be the kidneys. When the results came back it wasn’t good. She came out with the paperwork, a paper with a lot of red ink, indicating Hannah’s levels that were abnormal — so many of her levels were abnormal and not just a little abnormal but way out of normal range. At this point it was obvious that something else was going on inside Hannah and there was just no coming back from it. It was time. So I had to say goodbye and release sweet Hannah to be with all my other babies up at the Rainbow Bridge. It was heartbreaking to see her in the condition she was, especially when just the day before she was bouncing around. Hannah was a very special girl who left paw prints on the hearts of all who met her. I’m very grateful to have had these last two years with her. I know you’re up there rolling in green meadows and basking in the warm sunlight. Until we meet again, feel my love and know that we miss your sweet spirit. UPDATE 1/24/14: I had just come into the house from doing poop-duty outside and as I was about to slip back into my house shoes I noticed something white on the inside of my left shoe. When I picked it up, there lie a little white feather. I have to think that was Hannah stopping by to let me know she got her angel wings! 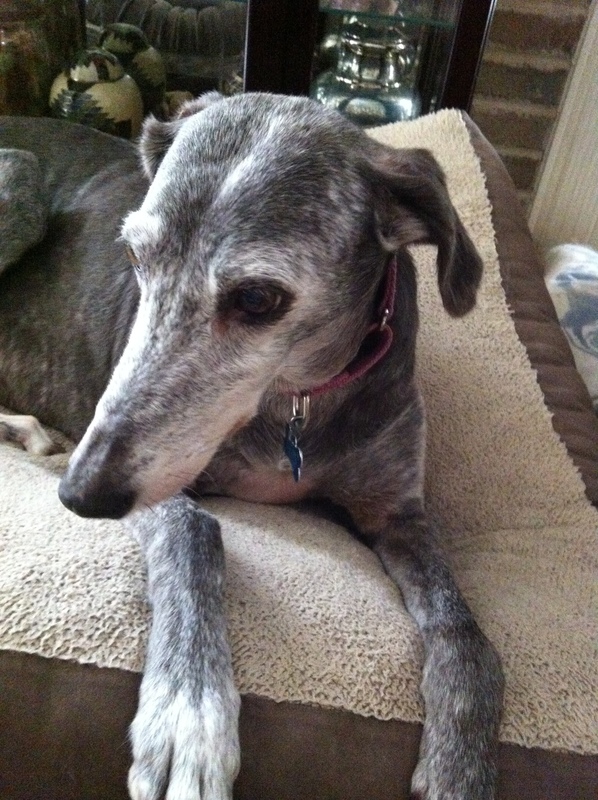 This entry was posted in Death, Dying and the Afterlife, Posts, Stories and tagged angels, beloved dog, celebration of life, death, dog, euthanasia, feather, green meadows, greyhound, rainbow bridge, saluki, sunshine, tribute by greyzoned/angelsbark. Bookmark the permalink. I’m so sorry Michelle …. 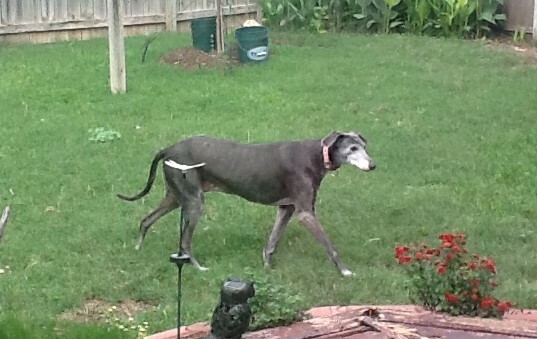 Hannah was such a sweet grey. I always loved seeing her when we visited. Blessings to Hannah, and blessings to Michelle, for your great service and huge heart. Thanks Lana. see you next week. Thanks Audrey. Miss and love you too! Michele, I just fell in love with Hanna! What a sweet ,tender soul! And I really love your blog! Hannah was special……and she needed a special home that you provided for her….our 3 will miss her as well. Thanks for the nice post! Thanks Karl. Hannah was particularly fond of Toby and I’d frequently find them both on top of my bed. They were dining buddies too since Toby also likes to be in a very quiet room to eat. she was lucky that you found her and she passed away loved. Thanks Mattie. I’m totally convinced the feather was Hannah. Almost every time I’ve lost a dog I get a sign a short time after. With Dodgy it was a feather also, with Maggie it was a swift breeze, with Harry it was a toy that started squeaking all by itself with no other dog near it and with Finnegan it was his belly band being in the doorway when I got home. I love getting signs from the angels! So now I bet every time you see a butterfly you think of Buttercup, huh? And I choose to believe that it actually is Buttercup checking in on you. Love you too. Thanks for telling Hannah’s story, what a special girl she was. So very sorry for your loss. No matter how short or how long a time you have a furever friend in your life. They always have a piece of your heart. Sound like you will be remembering this princess for a good long time with only happy memories. Oh thank you! I thought I caught a glimpse of Hannah today, or I just walked past her bed and expected her to be in it I guess. 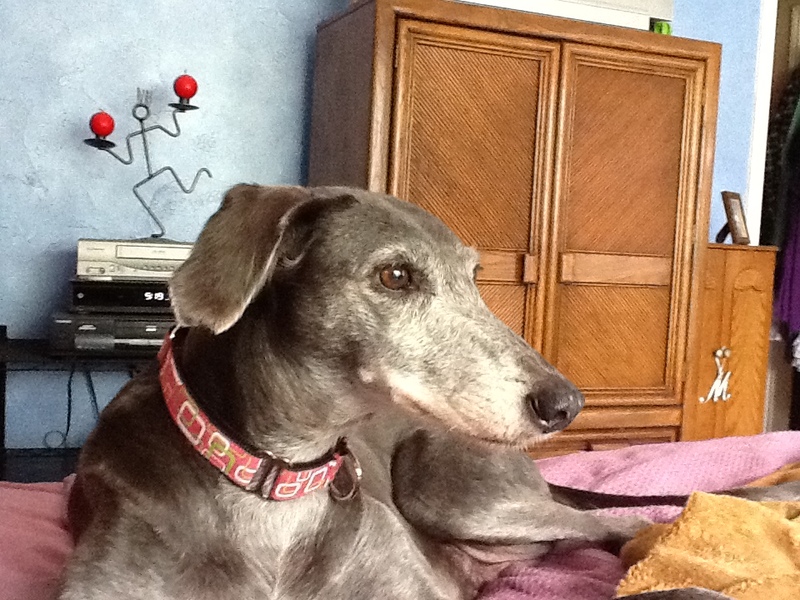 I now have 7 greyhounds waiting for me up there at that Rainbow Bridge. And you’re right, no matter how long or how short the time we have together, they always move right into our hearts. I adopted my Finnegan and even before the adoption was finalized I found out he had Lymphoma with a 1-3 month prognosis. I adopted him so he wouldn’t leave this earth as a homeless foster dog; he ended up having 8 months here in his “forever home.” And it was a fabulous 8 months. He was happy and healthy up until the day before his last. That was a real blessing. Thanks again for your comment and for reading my blog! Much appreciated. I can’t honestly say I like posts of this kind, because the writers’ love is so obvious that I know there has to be great suffering … Our pets have so much meaning for us that to lose them never gets any easier – never. It never does get any easier. But I look at losing our pets as the price we have to pay for them loving us and us loving them. I wouldn’t trade it for anything in the world. Agreed. We have to be strong every time we bring in a new one to own us: the joy is irreplaceable. Beautiful story and sounds like she had a beautiful soul. Thanks for the heartwarming story. What a nice comment! Thanks Shelley. I just had a dream about Hannah last night; I love when my dogs come to visit in my dreams. Thanks again for a really sweet comment. It’s been a while ago Michele but still big hugs. Each one of our dogs leaves an indelible mark and we are never the same after they are gone. It’s as of pieces of us are missing and we will be complete now only when the pack is one again. May you be happy wherever you are Hannah. Oh gosh, this is so sad and it’s so hard to lose a fur babe. This is tough but the feather is a sign and your Hannah is letting you know she is ok.
Hey Birgit! Thanks for the visit. I’ve been out of commission for the last few months. Pretty much on medical leave, so to speak (surgery etc). I was just reorganizing my blog menus and added a new section called “My Dogs” with multiple pages, which you found! Good to see you here! I’ll be coming back to blogging next month and hoping to stay more consistent. I miss y’all! See you soon!